Do your imperfect teeth cause you to feel insecure about your appearance? Are you tired of looking in the mirror and focusing on their flaws? You can revamp your confidence with a smile makeover from your cosmetic dentist in Herndon. Now, you can drastically improve their color, size, shape, and proportion in as little as two appointments with porcelain veneers. 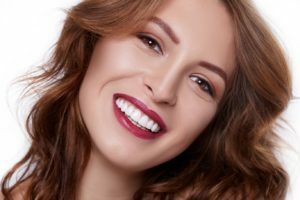 Porcelain veneers in Herndon are among the most popular cosmetic treatments because they produce natural-looking results while also correcting an array of issues. By attaching the thin shells to the front surfaces of your teeth, you instantly cover your concerns to have the radiant smile that you have always wanted. You can get a complete smile makeover by hiding dark tooth discoloration. Since porcelain closely looks like enamel and it is stain-resistant, your teeth will look natural and stay bright with the right aftercare, like maintaining your oral hygiene. Often, veneers are used to cover chips and cracks; however, they can also improve the appearance of your teeth that are shorter than average or those that have an abnormal shape. In some cases, they can even be used as an alternative to orthodontics to close gaps or make your teeth appear straighter. To ensure that veneers are right for you, you will need a consultation with your cosmetic dentist. Generally, if you have good oral health, you are a candidate for the procedure. To begin your smile transformation, your teeth will be cleaned, and their surfaces will lightly be etched. This is necessary to ensure that they will sit flush. When compared to veneers made from other materials, porcelain is thinner, so less of your enamel needs to be removed. This also allows the procedure to be less invasive as well. After your teeth have been prepared, impressions are taken, which are needed to design your veneers to meet your exact specifications, including the size, shape, and color you want. The dental lab will make them with precision and accuracy. This can take a couple of weeks. In the meantime, temporary ones will be attached. Once the dental lab has finished your permanent ones, you will return to the dental office to have them bonded in place. Now, you have the flawless smile that you have always wanted using a long-term solution. With the right aftercare, they can last an average of 10 years before needing to be replaced. If you are tired of feeling weighed down by unattractive teeth, it is time to revamp your confidence with a smile makeover. Ask your cosmetic dentist if porcelain veneers are right for you today! Since 2008, Premier Dental Care, PC has devoted their services to create healthy, beautiful smiles that last. In addition to general dentistry, they offer many areas of specialty, including cosmetic dentistry. If you are ready to make an investment in your confidence, contact our office today to see which cosmetic solutions are right for you.